Since opening its doors back in 1983, Sunflowers Café has consistently served up crowd-pleasing gourmet sandwiches, soups and salads. The eatery was the first restaurant to open in Raleigh’s Glenwood South district, where it thrived for more than 20 years. After losing the lease about six years ago, proprietor Deborah Ferebee moved to the current location near Seaboard Station. She’s never looked back since. The café features an open kitchen, and the warm, comfortable dining room contains tables and chairs situated among abundant live plants and flowers. A striking outdoor cypress arbor was constructed by Clay Ferebee, Deborah’s husband. 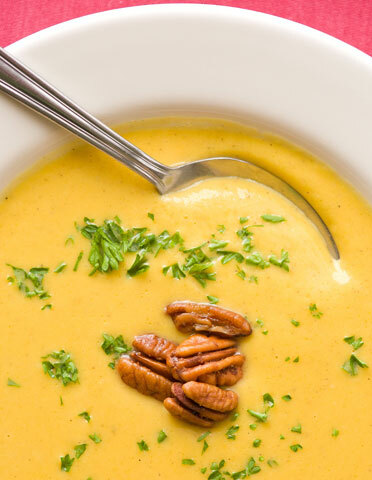 Among the three to four daily soups offered at the café include roasted red bell pepper with carrots and orzo; corn chowder; and house-favorite creamy butternut squash (pictured below). The butternut squash is the eatery’s mainstay winter soup.Suffused with thyme, ginger and a splash of tamarind, the soup is often made with chicken stock. Squash is often sourced from the State Farmer’s Market. Soups at lunchtime cost $2.95 and are subject to change throughout the week. It’s best to call to find out what’s being served on any given day. Sunflowers is open Monday through Saturday for counter-service lunch. The restaurant also offers full-service dinner Wednesday through Saturday from 5-9 p.m. and features house-ground Angus burgers along with entrees like wild-caught salmon and grilled pork tenderloin. I've always walked by here but never stopped. Sounds like I have to make my way over!